The world has 7 wonders. But Kansas has 8. The effort to promote and advertise the beautiful, weird and historic corners of the state was an effort to, I guess, encourage some state pride and promote some prairie tourism. Despite the folksiness, the list is delivered free of irony. Many of the sites are indeed worth seeking out. The list is incomplete though. The periodic accidental graffiti shows are one wonder I would have nominated. The spaniels and I experienced this by accident one humid August morning. Graffiti has started to earn the distinction of esteem. And I guess I’ve started appreciating more as well. But I’m not sure I realized its ability to really have a transformative effect until you are confronted with it in the last place you’d expect—a gravel road in small town Kansas. The French Spaniels didn’t think much of it, and at first I was a little frustrated our little treated to a free rapid fire show of the stuff. The locals may not think much of their cluttered grain and cattle cars, but for those who think this is an art form, the contrast is a real trip. And who knew our food travels in such style. So despite the omissions, the only wonder we were able to fit in to our last Kansas visit was an attraction known to the locals as the Underground Salt Mine. I had heard that groups as diverse as the Koch brothers, hollywood studios, and the National Archives have contracted to store documents, artifacts, film and other objects which their caretakers feel need to be secure but don’t need to be used. It’s not billed as such, but it must be among the the most secure storehouses in the world. The mine itself is 650 feet below ground. When you take the tour you receive your very own hard hat and breather (just in case something happens). After a wait in a gift-shop area, and a short video of the history of the mine itself, visitors crowd into elevators and enter the elevator that takes us down to the mine. Despite the safety warnings that are an ominous beginning, the mine itself was surprisingly comfortable. It is lit and open and has a pleasant feel. Despite a few hours spent at the various exhibits, none of our little group was in a hurry to leave. That may have something to do with the fact that the temperature in the mine is a constant 68 degrees all year long. And at our August visit the ‘surface’ temperature was nearing 100. The mine itself is a museum carved out of one of the largest rock salt deposits in the world. At the tour we learned the mine has produced rock salt (not for eating as we were repeatedly told on the tour, I think to prevent visitors like me from licking the walls). The salt is removed in a large checkerboard pattern where large square pillars of left to support the rock above and to allow fresh air to circulate in the mine. At the tour, we are reminded that what goes down in the mine stays there. So trash and newspapers are left there. The mines purpose was to blow up walls and extract industrial-quality rock salt. Its purpose is not for eating, but rather for use in ‘preserving hides and for use in road salt’. On the tour we are told the demand for the salt isn’t what it used to be. And current mining operations take place many miles from the museum, and the blasting of the walls to produce workable removable salt rock only takes place late at night. Another treat is an electric tram which visitors are told is a “dark ride”. An ominious title that I wasn’t too keen to participate in. I imagined a fast and scary ride, but the tour was quite pleasant. But the main draw for me was a glimpse at the underground vaults. And I guess it makes sense that we weren’t really allowed to see much of this part of the mine. On the tour we were often reminded that the mine has a perpetual 68 degrees and 40 percent humidity. Perfect conditions for preserving lots of documents. The company which operates this massive underground storehouse is named ‘Underground Vaults and Storage’. It has original film negatives of films like Gone with the Wind and Ben Hur, oil and gas charts, health records, and other assorted things. According to the company’s history the company was incorporated in 1959 when a group of Wichita businessmen, no doubt influence by Cold War concerns, decided to make use of the space, environment and conditions that was being created in the Carey Salt Mine. 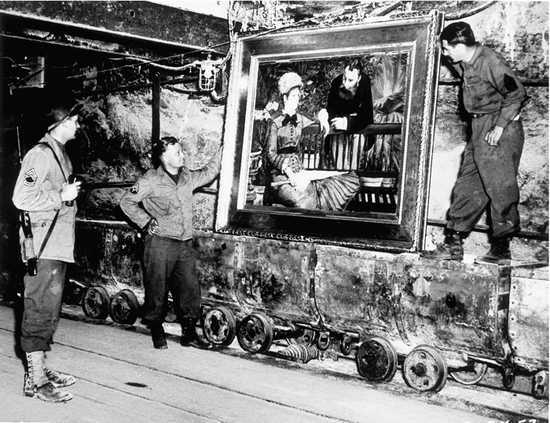 During World War II of course forces on both sides used salt mines to safeguard and hide works of art from the enemy. When many of these works were seized by allied forces that led to the strange juxtaposition of American GI’s, mine cars, and works of art. Pictured here are American GI’s at the Merkers salt mine in central Germany and Manet’s In the Conservatory. Robert Edsel of course has been collecting the stories of these Monuments Men, which accounts for the work of these soldiers between D-Day and V-E Day. I’m not sure if the Wichita businessmen would have been veterans of the war, or if they would have been familiar with the use of these mines to store works of art—but its seems very likely. At present the mine has a lot of the folksy charm of a goofy populist museum. But in the storage areas are objects from museums, governments, businesses, and others. The imagination wanders at the scope of material which might be collected there, and what might be lost. We know about the rediscovered libraries like the now strewn to all corners of the globe Cotton library, or even the tradition of preservation of islamic texts in Timbuktu (which is now at risk). Will the massive archive in Hutchinson and its other locations in Kansas City and elsewhere be forgotten or neglected, taken up by some future researchers or looters? Next Next post: Is Cultural Heritage a Human Right?